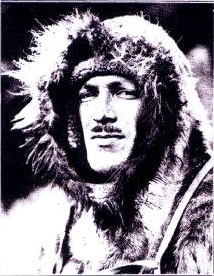 On admiral Byrd's second exhibition to Antarctica in 1934 he brought a team of 55 men and tons of equipment. That included a strange array of vehicles but also musical instruments and a radio transmitter. They broadcast from amateur radio station, W2ZK operated by Amory H. Waite Jr. Their weekly broadcasts included weather data, news and singing from the Knights of the Gray Underwear. The line up of the group included Joseph Hill, Charles Murphy possibly also Thomas Poulter, Epaminondas Demas and surely others. one of them played a home-made drum, another the jug, and Dr. Gill Morgan, their seismologist played organ. The Ohio State University Library actually has a 1934 recording of them singing an original composition titled "Penguins Parade." More here. As a radioman Waite stands alone. He not only broadcast from Antarctica, but he kept a diary and that transcripts his weekly broadcasts are archived at the Ohio State University Library. [SOURCE] The archive is quite extensive. Just the Amateur Radio Sub-series contains one cubic foot of records dating from 1938 to 1984. These records document W2ZK including correspondence and station logs from 1938 to 1984. He was born near Boston, MA in 1902 making him about 32 years old when they went to sea in 1934. He got hsi first amateur license as a boyscout at the age of 12. Waite joined the U.S. Navy in 1919 and went through the Naval Radio School at the Great Lakes Naval Station in Illinois. He later was a radioman aboard the U.S.S. Florida, and U.S.S. Arkansas. After being discharged in 1923 he attended MIT and graduated in 1926 with a degree in radio and electrical engineering. All that before shipping off to the ice caps. One biography claims he was also once the Chief Operator of New England's first television station.. but does not identify it as WBZ or W1XAY. But he did Waite later developed and patented a system to measure the depth of ice using radio waves. It's called radio ice depth sounding.